YONKERS, NY – February 19, 2019 – Yonkers Mayor Mike Spano today announced his annual State of the City address will be held on Wednesday, March 13, at 7:00 pm at the Yonkers Riverfront Library in Larkin Plaza. The State of the City will be the eighth address for the Mayor since coming into office in 2012. Residents will be able to view Mayor Spano’s address live on-line at www.YonkersNY.gov and locally on television channel 39 (FiOS) and channel 78 (Cablevision). A live broadcast also will be available on social media platforms Facebook & Twitter atwww.Facebook.com/CityofYonkers &www.Twitter.com/CityofYonkers. YONKERS, NY – December 19, 2018 – The City of Yonkers this week was awarded a $1.25 million grant for the continued daylighting of the Saw Mill River by the Mid-Hudson Regional Economic Development Council. The grant will help fund Phase 4 of the multi-phase revitalization project which includes a new urban river and parks through the center of downtown Yonkers. Phase 4 of the Daylighting of the Saw Mill River proposes continuing the return of the Saw Mill River to its natural state by ‘daylighting’ it. The river was once buried in a concrete flume throughout downtown in the 1890s-1920s. The City of Yonkers plans to build on the major ecological, economic and educational impacts of earlier Daylighting phases, which have been nationally and internationally acclaimed. Phase 1 and 2 spurred $500 million of housing and mixed-use projects, plus an additional $500 million approved or proposed developments including the $190 million Rising/RXR Realty mixed-use development with 440 units being constructed on the south edge of Phase 1 now known as Van der Donck Park. Several other major residential developments are also under construction, approved or being proposed, continuing the downtown transformation. The daylighting has attracted new restaurants and high-quality tech jobs including 185 employees at the new headquarters of tech giant IAC Applications. On November 14, 2018, Daylighting Phase 3 was officially completed, which creates a gateway river-themed 1.25 acre park along the Nepperhan Avenue arterial. Phase 3 is a seamless river walk park with the adjacent Phase 4, which will unearth the river near the Chicken Island parking lot, recently purchased by AMS Acquisitions, which plans to construct a major mixed-use redevelopment that will create hundreds of construction and permanent jobs. The grant award comes from the New York State Environmental Facilities Corporation’s (EFC) Green Innovation Grant Program, which previously funded Phase 1, 2 and 3. This EFC grant coupled with the 2016 award of $2.4 million from Empire State Development’s Capital Program now gives Yonkers a total of $3,650,000 for the Phase 4 project. 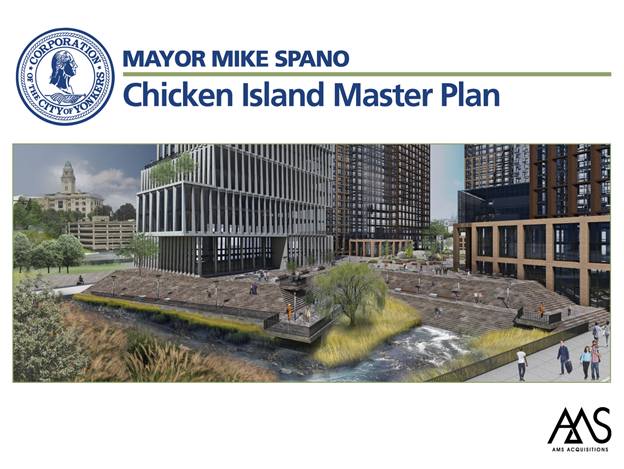 YONKERS, NY – October 29, 2018 – Yonkers Mayor Mike Spano today announced the sale of the downtown parcel commonly known as “Chicken Island” to developer AMS Acquisitions LLC. AMS Acquisitions agreed to purchase the six acre property from the City for $16 million. AMS and the City have signed a letter of intent for the sale of the property, with AMS paying an $800,000 deposit. The balance of the funds will be paid once the sale is approved by the City Council. “This plan is hard evidence that Yonkers has turned around and that it is where investors and residents see a bright future,” said Mayor Spano. Mayor Spano also noted that the plan will require that ten percent of all units be affordable and rented to persons with moderate incomes. AMS Acquisitions’ vision for “Chicken Island” is it to become the epicenter of the downtown, with a concentration of shopping, dining and experiential retail, coupled with multifamily buildings, an office component and a luxury hotel. Coined “Chicken Island” in the late 1800’s when a small island in the Saw Mill River was used as a local chicken farm, the six acre site is located to the north east of Yonkers City Hall. The site is zoned D-MX (downtown mixed use zoning) a high density zone permitting development up to 25 stories and which permits a wide variety of uses including retail, restaurant, office, colleges, personal service establishments, residential as well as many other alternatives. AMS Acquisitions’ development of “Chicken Island” will complement the building of the new Fire Station 1 on New School Street and the soon-to-be completed Phase III of the Saw Mill Daylighting along New Main Street. AMS Acquisitions LLC (AMS) is a real estate investment firm which focuses on the acquisition and development of retail, residential, and office properties in the New York Metropolitan area. Since forming in 2012, AMS has built a portfolio of approximately 1,500,000 square feet throughout New York, New Jersey and Connecticut. AMS’ development portfolio consists of an excess of $1 Billion in total capitalization. AMS’ expertise in multiple asset classes gives it the ability to understand and unlock value on both ends of mixed-use projects. Some of AMS Acquisitions’ current holdings include mixed use properties in Brooklyn, Manhattan, Queens, New Jersey and Yonkers, including 86 and 92 Main Street.